Have you ever thought you were totally organized and on top of things only to realize - Not! Ugh, I thought I had my two-page layout done for when I was ready to post only to find it most of the components buried under a stack of scrap cardstock and notes for my sons school project. I didn't want to rush putting the layout together because it is for my scrapbook of my daughter, so I decided to do a quick card. Tammy, you couldn't have picked a better stand in...your card is fabulous! Looking forward to seeing your layout! 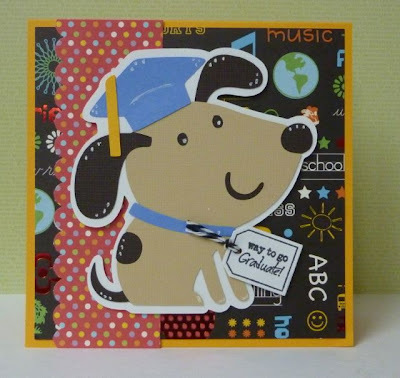 Oh my that little graduation dog has to be one of the cutest images ever---super card!! Very cute Tammy! Love the papers! Piles? What piles? Hey Tammy! I love this card! It is so "dog"-gone cute! Love your papers and the layout is awesome. Fantastic job! That dog with the graduation cap is so cute! I love the little tag you added and that fun background paper! This card is adorable! Would be perfect for my niece! !